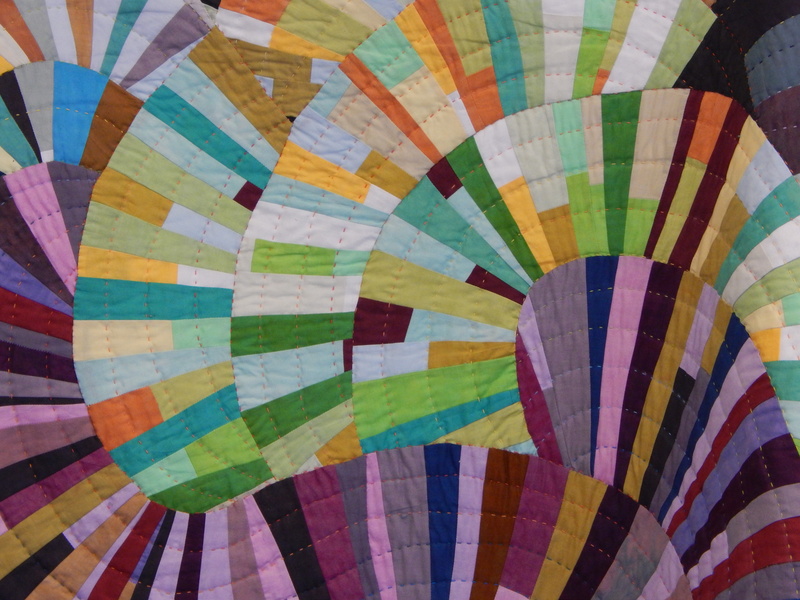 The big rug hooking convention is coming up in a week. 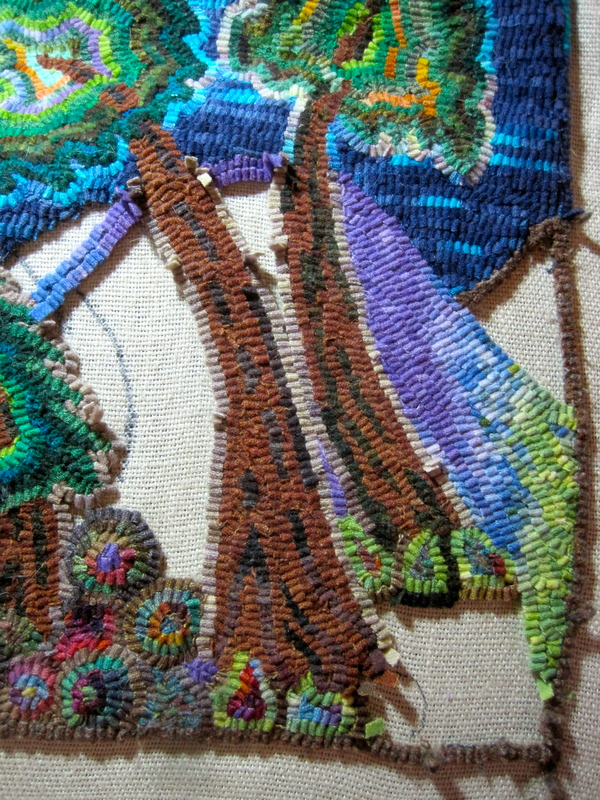 So being the very organized procrastinating artist that I am, I have had to work non-stop to try to finish the rug (that I started over a year ago) for the exhibit at the convention. I finished the interior of the rug, and then started to figure out how to do the border and put the words onto the quilt. I consulted all my friends and a few professionals. The teacher that got me started on the rug suggested a red border with yellow lettering. What the wha??? I couldn’t figure out where she came up with that idea. 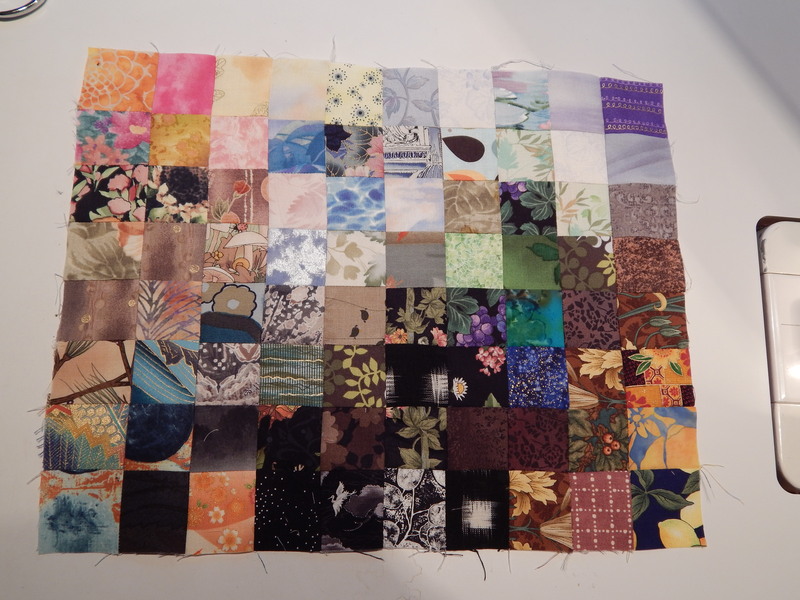 But after trying out a number of different color combinations, I saw that she was right. A red coral was a more acceptable color to me, and so that started me on a 3 day adventure of trying to dye just the right color of red coral, and a little yellow for the lettering. I used to do a lot of dying, but I’m a little rusty now. 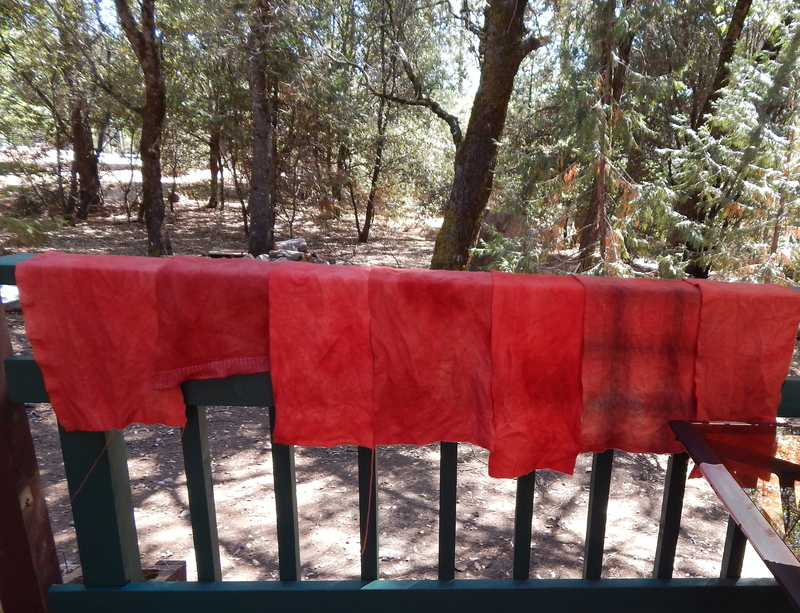 Anyway, after a few stops and starts, and a little dye spill on my new stove, I was very pleased with the color I got. I dyed over a number of different neutral wools, so I got a little variety in the final results, which I think adds to the interest when you are hooking. 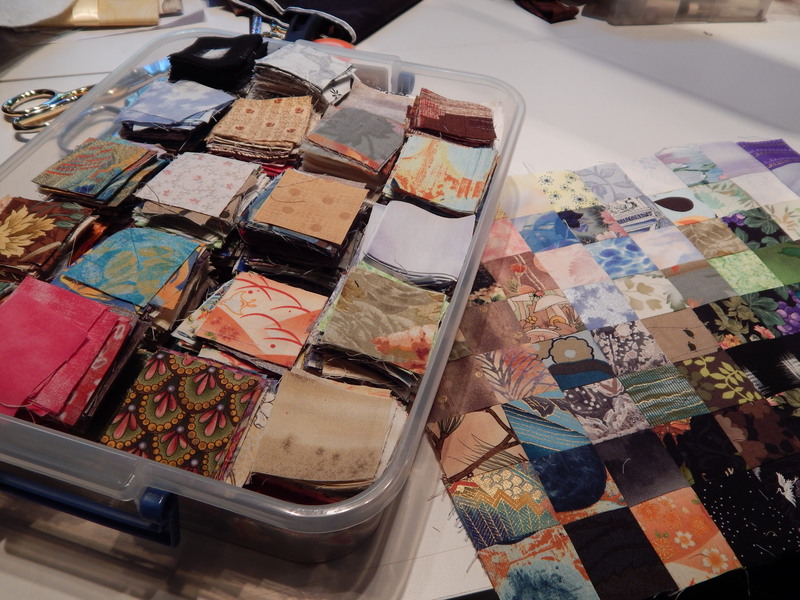 When I am very busy doing things other than quilting, I revert to my little box of two inch squares to satisfy my need to put pieces of fabric together. 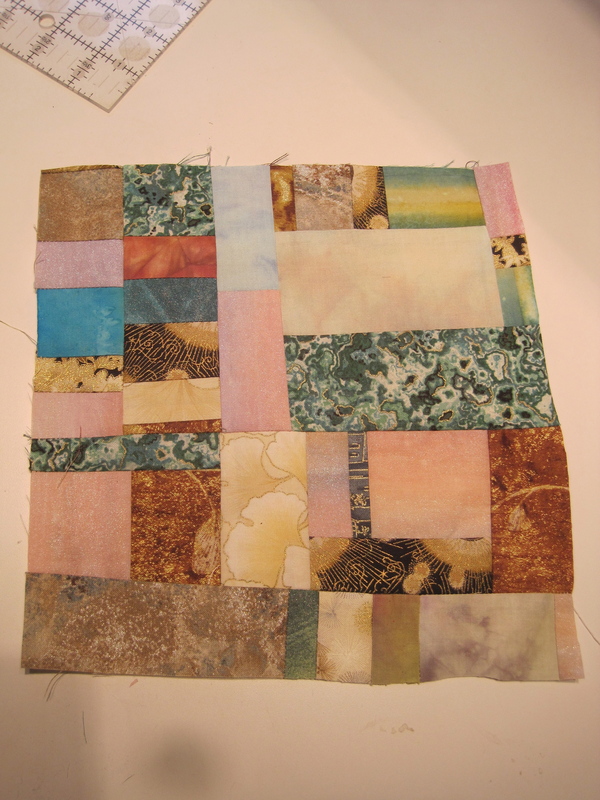 I had the idea to start with one square and just built a quilt from that, doing a color drift kind of idea. This is VERY fun to do. But it does take longer and longer to add a side on to it. She encouraged us to use lots of colors. Here’s a view of our work stations! And, back to the rug! I used Gene Shepherd’s method of putting the lettering on without drawing it in first. I planned to put two lines of writing above the rug, and two lines below. I was almost all the way through the first line of writing when I realized that I had hooked the wrong line next to the rug! 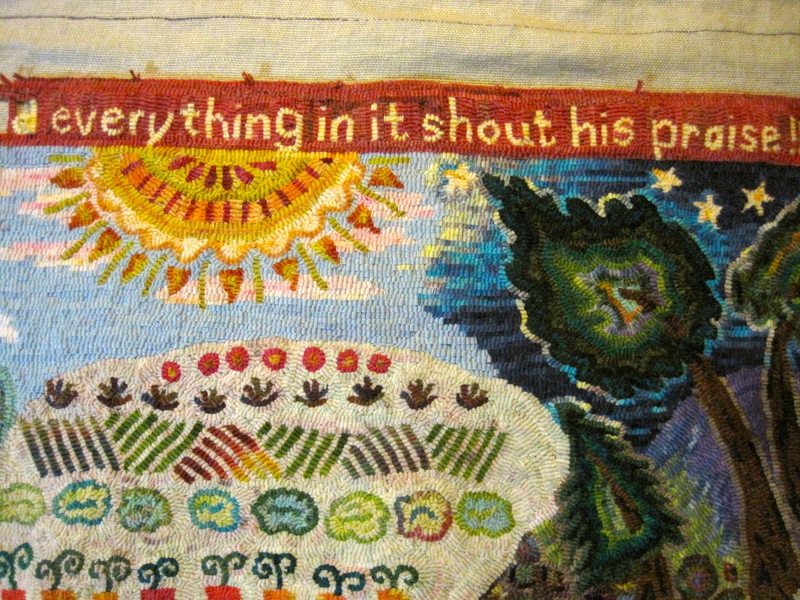 Plan B: I would hook the words all the way around the rug, and hope against hope they would fit. I got to the last line, and realized I was running out of room. I looked at the verse again, and only had to leave one word out, and have it still make sense. Whew. Disaster averted. 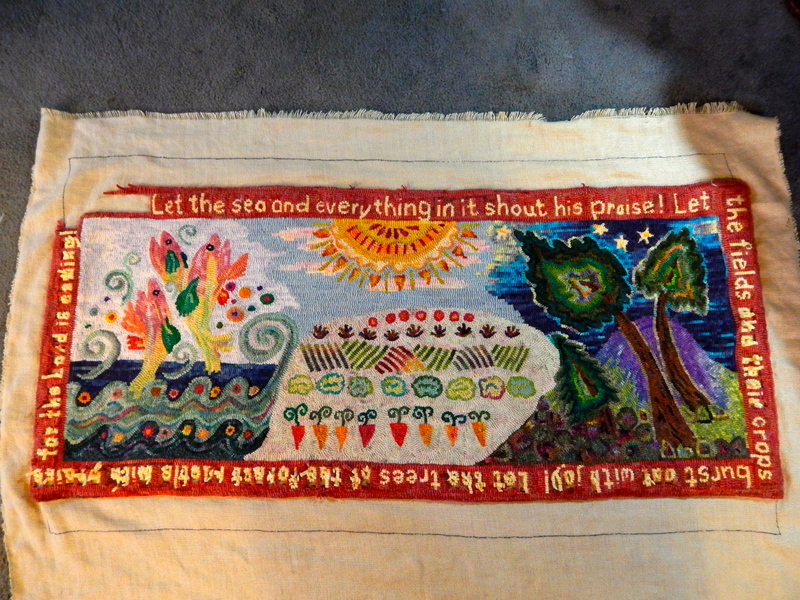 Today I will be filling in the coral red background around the lettering, and then I will still have a bit of work to do, blocking, whipping the edge, and binding the rug. But I am fairly confident I will finish by the time I have to leave next Tuesday! 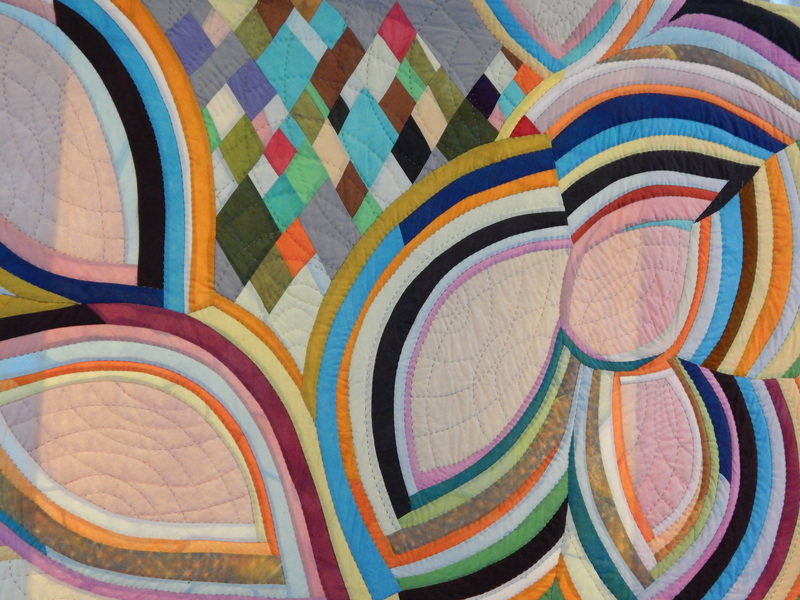 I’ll be back in a week or two with more quilting news and views!! Labor Day was a very good day of work for me. I’m not sure you can call it Labor, when you are doing something you love. Something put me in the mood to document how a day goes in the life of an artist. 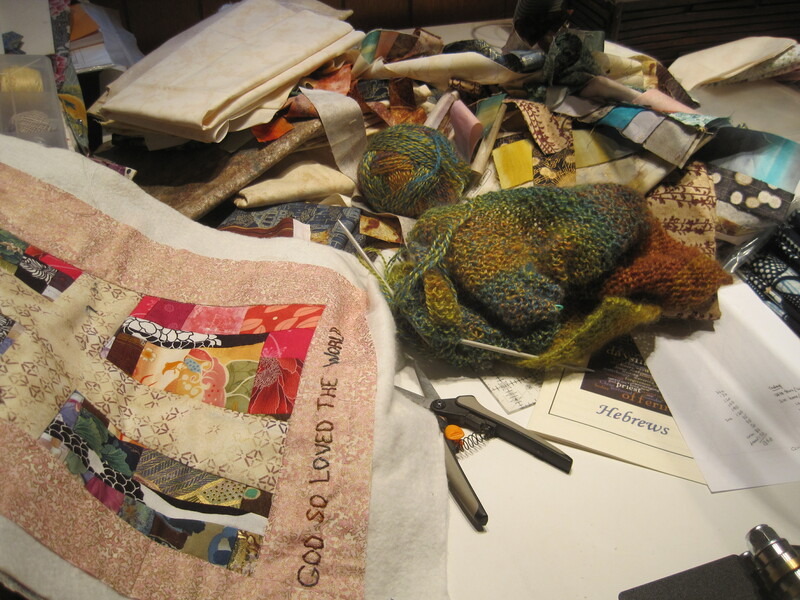 Sunday I had written myself a little note: “clean off work table so you can start work on the next Psalms quilt.” I didn’t get that done. So that was my first task Monday morning. 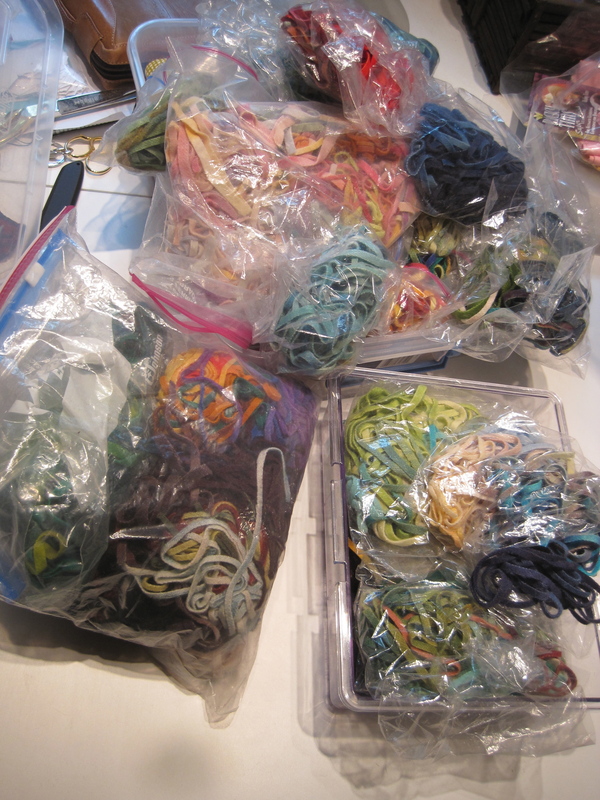 This is what my work table often looks like. Then it reaches critical mass, and I can’t work there any more until I clear it off. These are bits and pieces of a bigger project that I am working on. The idea for it is not completely formed, so I just do a little of it once in a while. 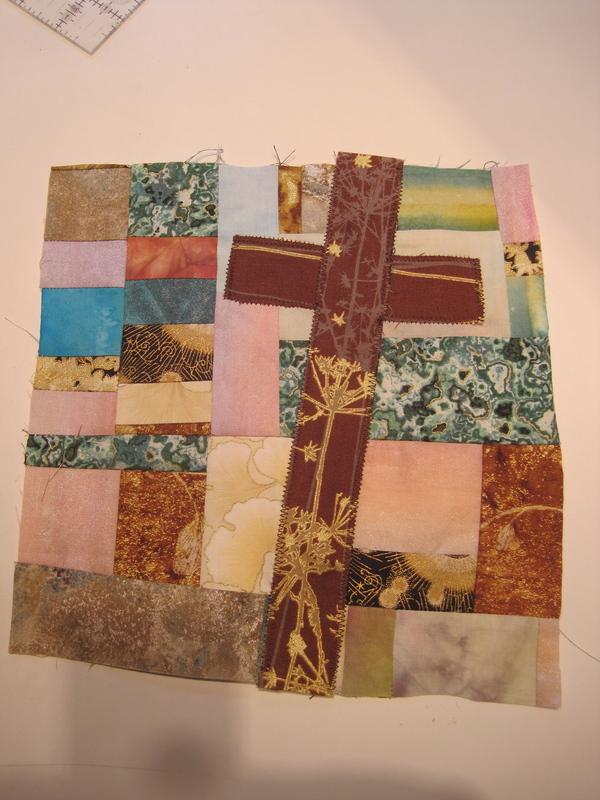 But first, before I put it away, I had the idea to make another “leftovers square” as the background for one of my little cross quilts. 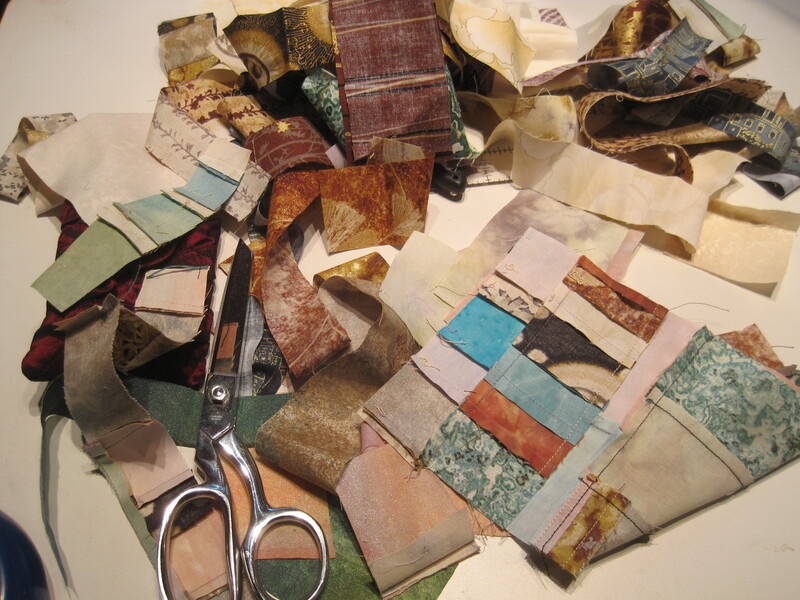 I am loving making these–lately that has been my Sunday morning meditation–to complete one. That little project completed, I organized the leftovers of the leftovers and put them away. 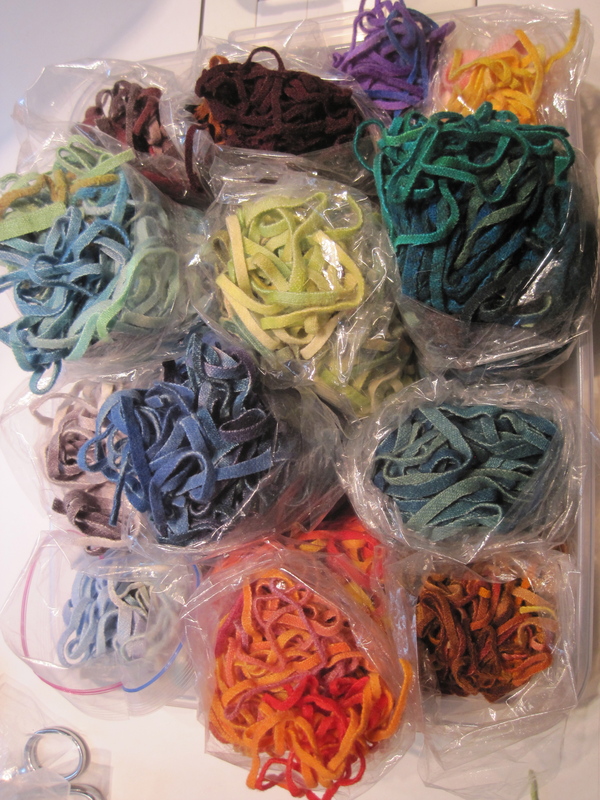 Then, I got it into my head to organize another messy craft–my rug hooking “worms.” That is what some people call the leftover strips from hooking a rug. 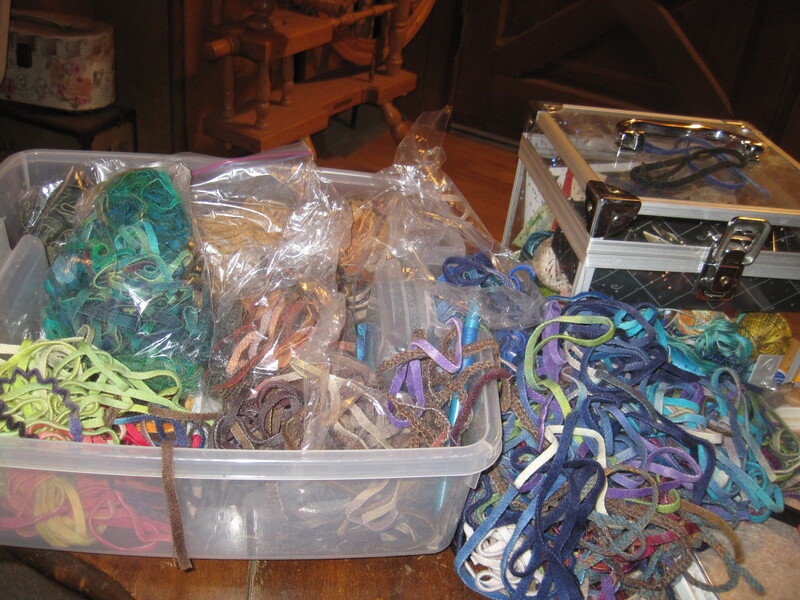 I have an exhorbitant amount of these leftovers, considering how few rugs I have actually hooked. 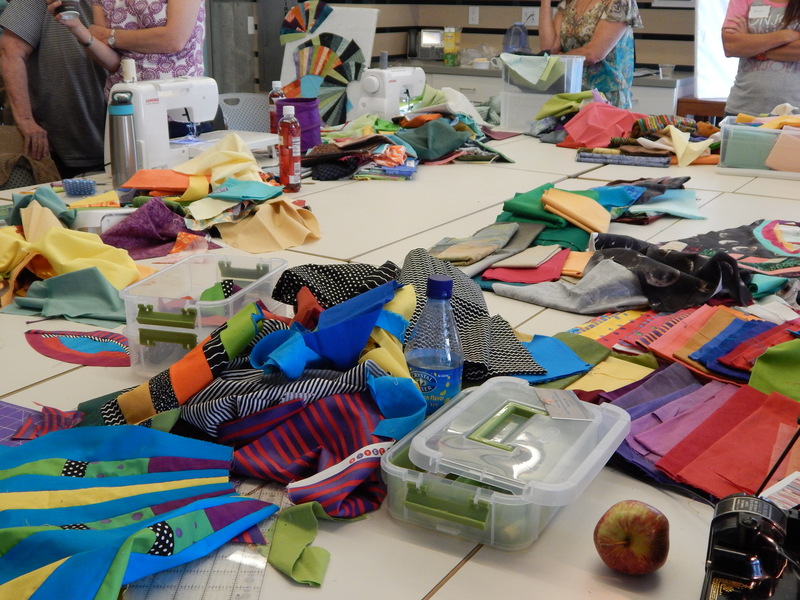 The teacher for the next class I am taking (at that big conference at the end of the month) said that it is fun to use the bags of leftovers when they are organized into color families. So I did that. 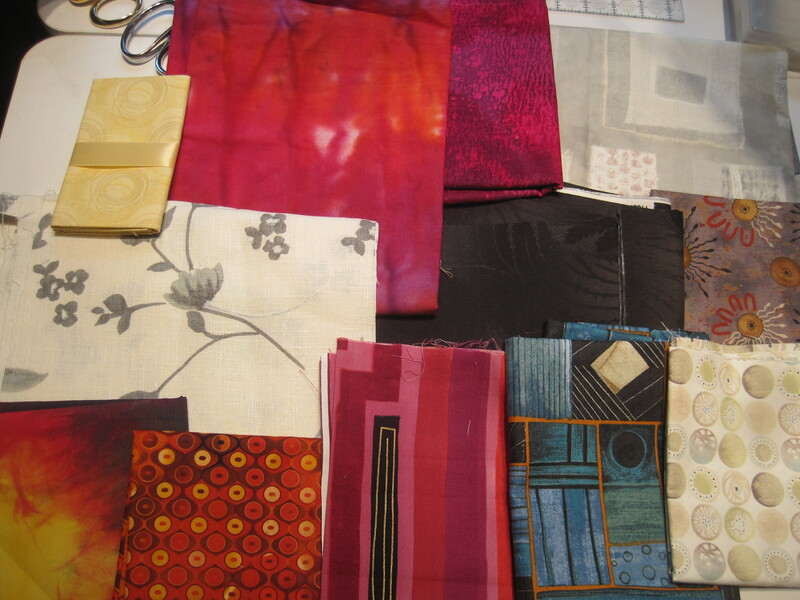 Finally, I could lay out the group of fabrics I had chosen about a week ago for my new project. Ahhh…I love this part! 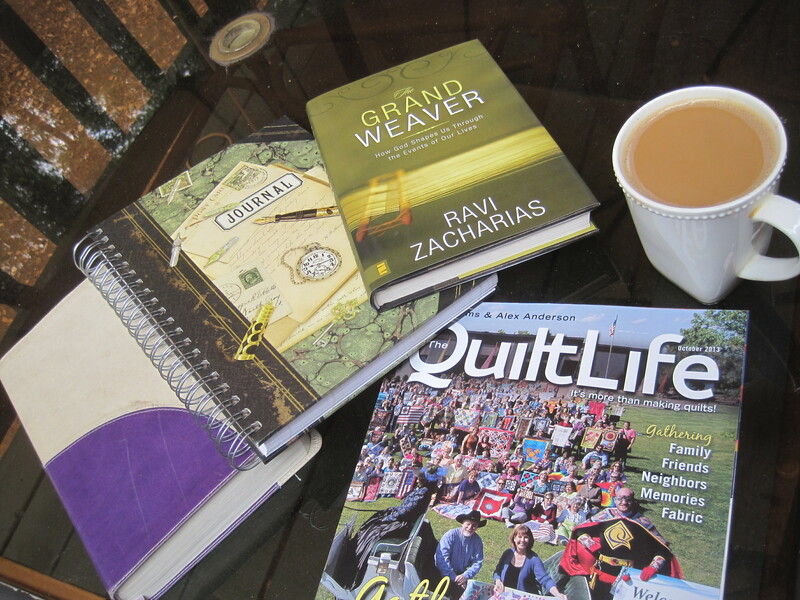 And when I returned home, I needed another cup of coffee, and I still hadn’t done my morning reading. I am loving sitting out on my “new” deck. And here’s what my side table looks like. Hooking rugs is a rather messy affair. So that was it. I sat and hooked and hooked. And hooked some more. 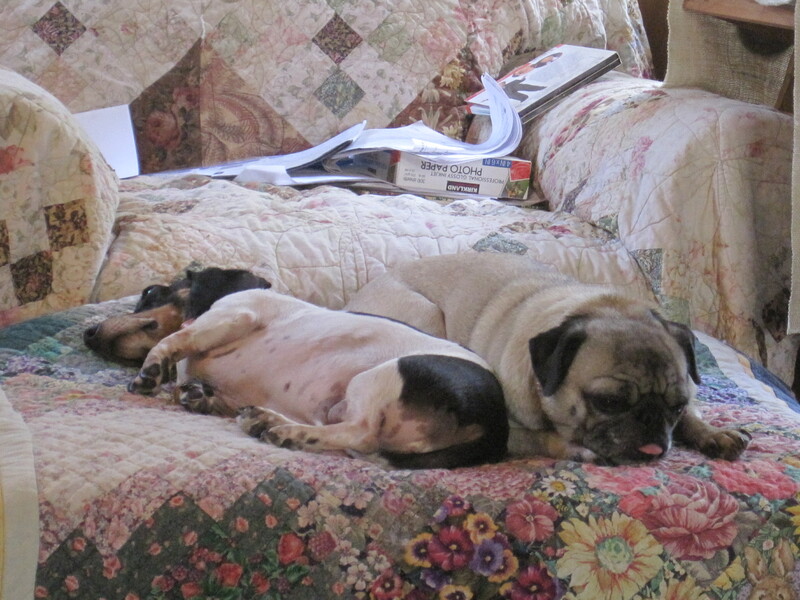 The little girls were rather bored with my long stitching session. 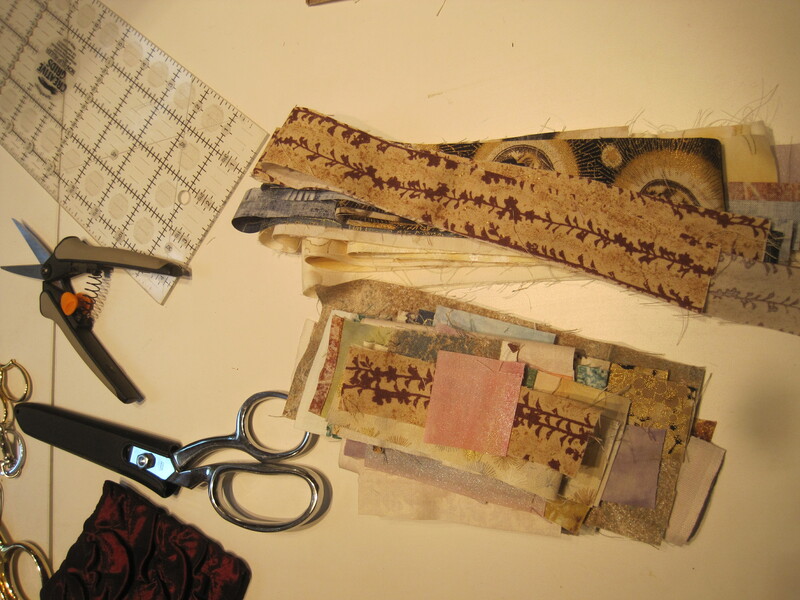 And by 9pm (I NEVER work this long on one project–most days end creatively at dinner time!) the rug was finished!!! P.S. I wrote my thoughts on “being an artist” over on my other blog. Check it out to see what goes on inside the mind of a working artist.